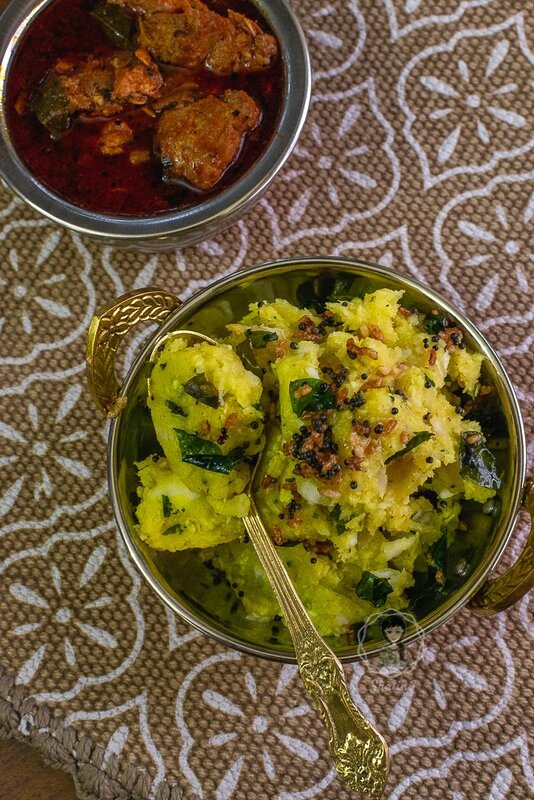 You cannot not have Kappa Vevichathu and Meen Curry on your trip to Kerala. This perfect combo is your remedy to authentic and delicious Kerala food. Let me share some facts before I start talking about the preparation of Kappa Vevichathu. These days, this dish is served in all the resorts and five-star hotels in Kerala. 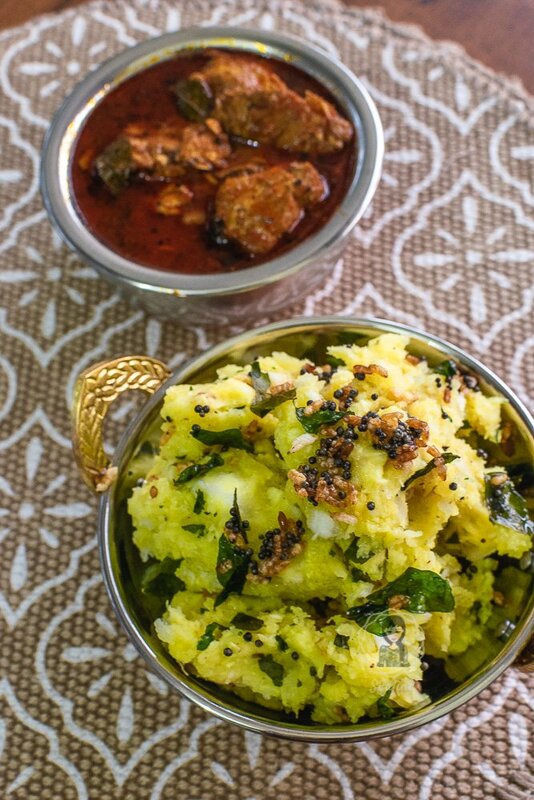 As I mentioned, Mashed tapioca and fish curry is one ultimate combo which you can’t resist! However, the irony is that, it was considered a poor man’s staple. Yes, indeed! Back in those days, Kappa or tapioca was a perfect substitute for those who couldn’t afford rice. And now, it is served in a silver platter at exorbitant prices. 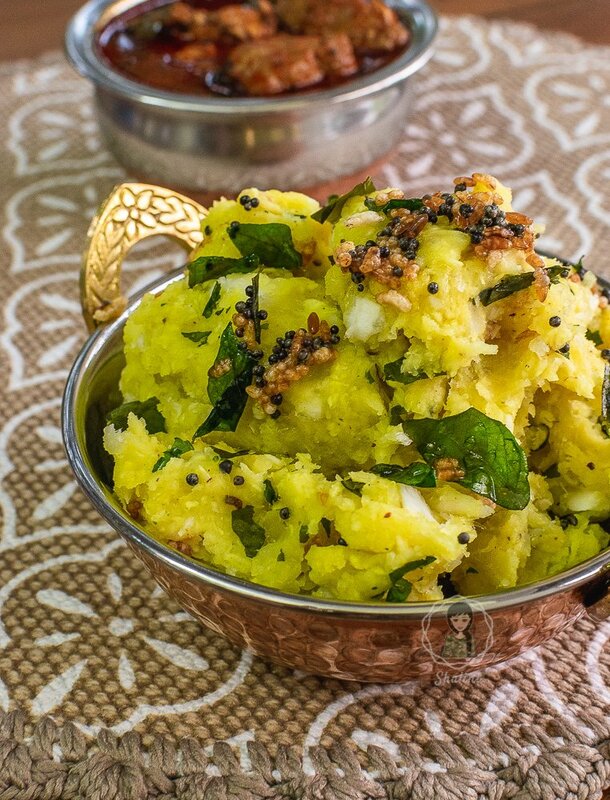 Malayalees across the world crave for traditional Kappa dishes. I know that for sure because the husband get these cravings some days. The man isn’t really particular about the food that he eats. Thanks to his two-decade long life in the Army, he can survive on anything. But on these Mallu food craving days, we list down the things to eat on our next visit to Kerala. Oh, yes. More than the places to visit, this is a checklist that we follow. Nope. Not joking! 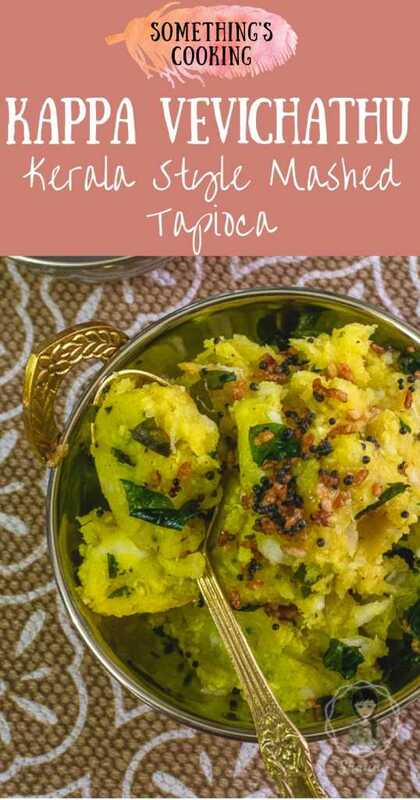 The two popular Kappa dishes which you’d find in Kerala are Kappa Puzhungiyathu where the tapioca is only boiled and a tempering is added, and Kappa vevichathu where the tapioca is cooked and mashed with coconut and other spices. While the former has my heart, the latter is available in almost all the restaurants and toddy shop across the state making it an absolute favorite for every Malayalee. Clean and cube tapioca. Boil tapioca in a pot of water and strain. Fill the pot with hot water again and bring to a boil. Season well and let the tapioca cook. In the meanwhile, coarsely grind grated coconut, green chillies, garlic cloves, cumin seeds, curry leaves and turmeric powder. Make a well in the centre of the cooked tapioca and add this mixture to it. Mix well until it is cooked, well-combined and mashed. Prepare a tempering in coconut oil by adding mustard seeds, curry leaves and about a tablespoon of raw red rice. Saute until the rice turn white. Add it to the mahsed tapioca and mix well. Serve hot with the exotic Kerala Style Red Fish Curry. 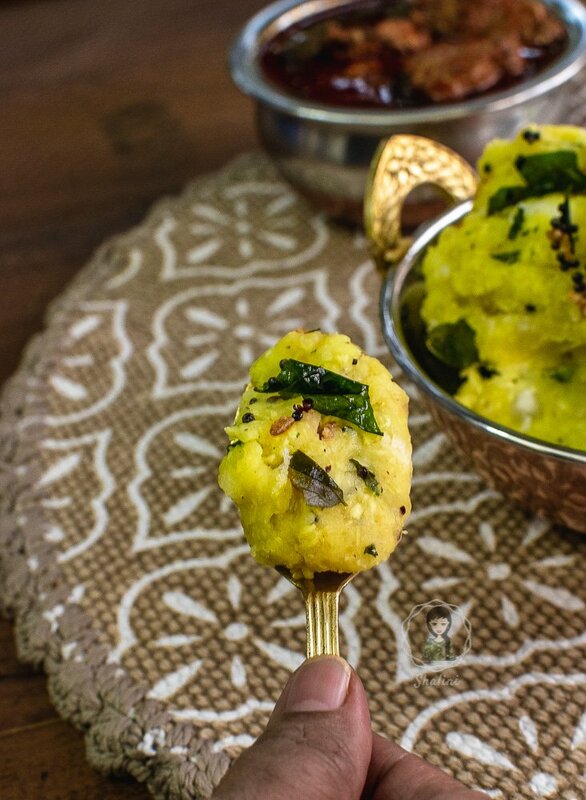 This traditional Kerala food made with tapioca, coconut and spices is finger licking good! Boil tapioca in a pot of water and strain. Fill the pot with hot water again and bring to a boil. Season well and let the tapioca cook. In the meanwhile, coarsely grind grated coconut, green chillies, garlic cloves, cumin seeds, curry leaves and turmeric powder. Make a well in the centre of the cooked tapioca and add this mixture to it. Mix well until it is cooked, well-combined and mashed. Prepare a tempering in coconut oil by adding mustard seeds, curry leaves and about a tablespoon of raw red rice. Saute until the rice turn white. Add it to the mashed tapioca and mix well. 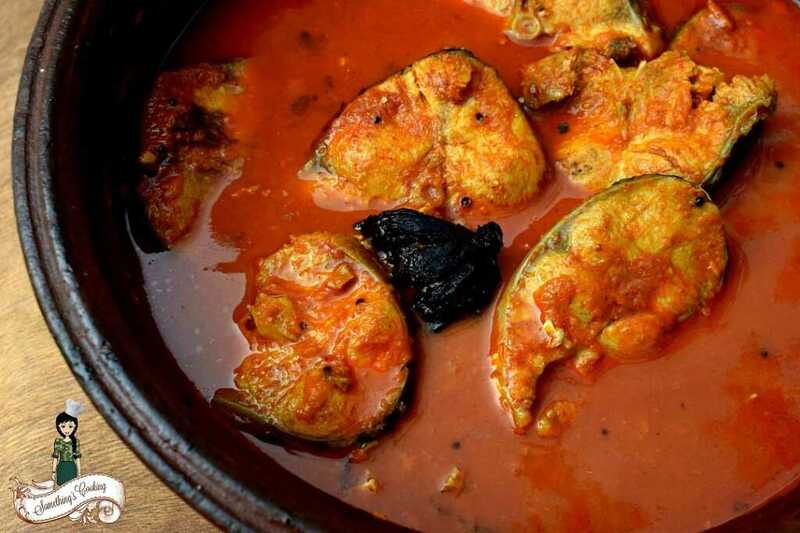 Serve hot with the exotic Kerala Style Red Fish Curry. Have you had Kappa? Let me know. I hope you’ll drop by tomorrow too. My theme for the A to Z Challenge this year is ’26 Kerala Dishes that have my heart’, where I would share a multitude of vegetarian and non-vegetarian dishes from the Spice Capital of the World- Kerala! Don’t miss out on any new updates. Subscribe to my blog (find the subscription box on top). Share and connect with me on social media. P. S: Do you want to treat yourself with some great book recommendations this Spring? 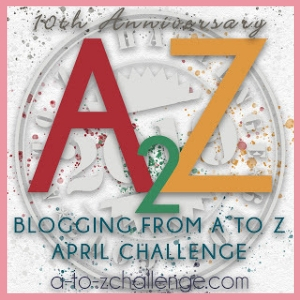 Head over to my lifestyle blog where I would be sharing 26 books, authors and fictional characters that I love, loathe and tolerate. What a different preparation using tapioca. Here, we have it more during fasts. But a good recipe to go for rather than usual sabudana khichdi. Will definitely try this. I am discovering so many new dishes. Once the challenge is over the cook will take over the blogger. Great one. This look tempting. Love the recipe again. I know how much my Malayalee friends love Kappa. I have only made the first version but this one seems nice and spicy, the way I like it. I will certainly try this the next time I can get hold of kappa. I have tried eating Kappa in Kerala with often with mixed feelings each time. I am tempted to try it at times in the canteens of Infopark, Kochi where I work. But somehow I have not yet become a Kappa regular. Your recipe is definitely interesting.. I went to a typical Kerala style restaurant when I visited Cochin but can’t remember if I had this dish or not. But will definitely put it on my check list for when I next visit Kerala. I just jumped to your post reading Kappa 🙂 I love it and it is my husband’s favorite, we get it from a Kerala Store near to our house. I LOVE Kappa and Fish Curry. I have had it with Chicken Curry too. Thanks to you , I can now manke it too. What i have eaten in restaurants is a bland version. Your recipe of Kappa loks and sounds delicious, Like a meal by itself. No, I never heard about it. But It is looking delicious. 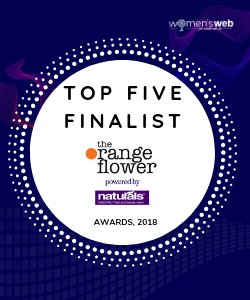 yay…. glad to see kappa here. I was thinking K would be some version of “Kerala style xyz curry” missed out the obvious. This looks yummy! When I visit my hometown, even I usually have a list of things to eat rather than the places I want to visit. Everything looks and sounds delicious! No Intention to Spam You! Something’s Cooking is now on YouTube! © The blog and its contents, Something’s Cooking, 2014-2019. 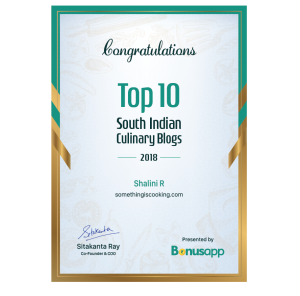 Unauthorized use and/or duplication of material (text, photos or both) without the written permission from this blog’s author and owner Shalini R. is strictly prohibited.